However, despite the hype around data science, artificial intelligence, and machine learning, much of the work is still cloistered away on disjointed data science teams. Every company wants to use it, but few know how. In fact, a report coming out of MIT Sloan showed that while 85% believed AI would give them a competitive advantage, only 20% of the respondents were actually using it. Why is AI/ML so hard to implement? Much of the challenge comes down to the manual aspects of the machine learning analytic cycle – accessing data, preparing data, exploration and feature engineering, model validation and finally operationalization. Even with the most powerful cloud computing and machine learning algorithms, the heart of the matter lies with the data. Therefore, in order to shorten analytic cycles and gain the competitive advantage, organizations need to find ways to streamline and simplify the data processes for machine learning. All the while, this disjointed process leaves key stakeholders out of touch and out of the loop. Without a continuous link between data, modelling, validation, and operationalization, the AI/ML data cycle is bound to stay inefficient and prone to errors. Let’s look at each of these obstacles more closely. Organizations are swamped with data. This presents both an opportunity and a challenge. The opportunity is the use of more data means better models and more accurate results. The challenge is getting to the data. Many organizations silo their data in disjointed places that are hard to navigate. Data scientists then need to make data requests from IT which can add weeks or months to their analytic cycles. Data scientists can spend up to 80% of their time on data preparation alone, according to a report by CrowdFlower. In today‘s fast-paced marketplace, this is unacceptable. When data prep takes up the majority of an analyst‘s workday, they have less time to spend on the actual tasks of building models and drawing insights. Again, this phenomenon arises mainly from the abundance of manual data processes surrounding the organization. Data exploration is critical to the machine learning process. It is essential to identify which datasets are most likely to be relevant to the problem being solved. Data exploration, as well as algorithmic exploration, helps feed the feature engineering part of the data science process enabling the data scientist to more efficiently see what variables are most important to the problem at hand. Therefore, analysts end up spending inordinate amounts of time exploring and trying to understand the data. Without a modern exploration platform, this can be a very resource-intensive process. Model validation is also a highly manual and difficult process today. Data scientists will explore model output in Excel, or the simple charting functions mentioned above can be applied to model testing output, but they only provide simple, one-dimensional views of the results. Data scientists need to dig deep into the testing data to explore the results of a model in any number of dimensions and down any number of exploration paths in order to truly see how a model behaves. This process should also involve the business stakeholders, so they can see how the model behaves and add feedback from a business perspective. But when this process is separated from the stakeholders and the rest of the organization at large, it becomes hard for analytic teams to get the feedback they need. the wall to IT, who then codify and build a custom data framework to feed the model. This is a lot of duplicated work, not to mention highly error-prone. At this stage, teams must also take into consideration potential security, governance, and compliance requirements that need to be applied to the machine learning problem. Organizations need to be accountable to stakeholders about where the data goes and what happens to it—which adds another level of complexity. With all these problems and resource-intensive processes, it is no wonder why machine learning analytic development and deployment cycles are so long. Sometimes they never even see the light of day within the business. Modern data preparation, exploration, and pipelining platforms such as Datameer provide the proper data foundation and framework to speed and simplify machine learning analytic cycles. They provide the self-service tools for preparation and exploration, scale, automation, security and governance to alleviate all of the aforementioned gaps in the machine learning analytic process. Let‘s look at how. One of the most important steps in the machine learning process is making sure your team has governed, self-service access to more data, so they can find the right data for the problem they are solving. An enterprise data preparation platform brings together data engineers, who manage access to data, and data scientists, who need access to the data and easy preparation steps, onto a common platform to collaborate. This helps organizations curate a large number of datasets that can be catalogued and available for analytic purposes. Feed their machine learning models to train and test their models. The platform‘s built-in catalogue gives the data scientist the ability to understand and find more data related to their questions. This also means that data scientists can access and explore the data in one place instead of pulling it from various sources. In the case that the analyst needs to access a different dataset, the data engineer can fulfil this request in a matter of minutes. A modern data preparation platform such as Datameer dramatically reduces time to insight by providing self-service interactive interfaces for teams to prepare data – clean, shape, blend, aggregate, organize – as well as explore the data at scale. Datameer offers a spreadsheet-style interface with a robust suite of over 270 functions, many of which are Excel-like, making the approach very familiar to a data scientist. This non-technical interface makes it faster and easier to prepare the data for machine learning purposes. A major part of the data engineering component of the data science process is to dig in and understand how the various datasets, and the data as a whole, relates to specific problems the data scientist is trying to solve. This involves two key aspects: data exploration and feature engineering. Datameer goes beyond your typical data preparation tools by offering unconstrained visual data exploration at scale. This allows a data scientist to interactively explore even the largest datasets to identify relevant aspects and patterns of the data to see the relevance to their problem. Datameer Visual Explorer allows interactive exploration of datasets into the many billions of records with response times in the seconds. It uses a unique dynamic indexing technology that allows a data scientist to explore across any dimension, value and metric in the data, and switch at any time. This enables a rapid, “fail fast” exploration of any number of paths within the data to see the most important nuances. Datameer also offers a number of unique features for algorithmically exploring different attributes in the data. Data relationships, decision trees, clustering, mathematical and other built in algorithms and functions allow the data scientist to do a first pass at feature engineering to see what attributes may be most relevant to the problem. Analytics is an agile, iterative process—not a linear one. Data is prepared and models are created, tested and validated multiple times in a cycle to try and get the best possible model. This ability to iterate on model feedback and validation is a crucial piece of this process. By feeding modelling test results back into the visual exploration tools, the analyst can speed their model validation process. The re-implementation, or operationalization, aspect of data science has long plagued its’ ability to deliver value to the business. The complex, custom coding process can easily add weeks or months between the time a model is deemed ready, and when the business can use it. And as models evolve, the delivery of new models get delayed as well. Once the data preparation has been performed, this data flow can be operationalized and automated to run at scale. 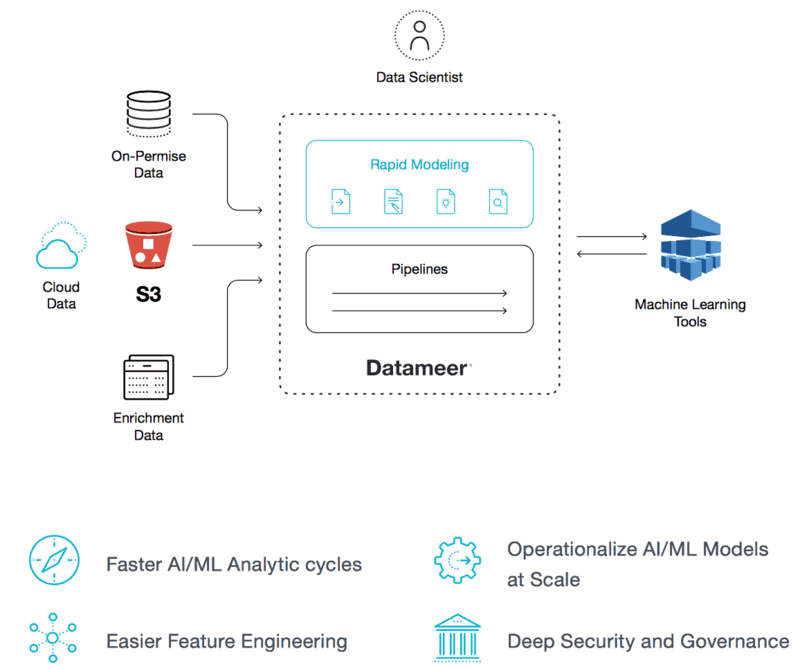 When completed and validated, Datameer’s plug-in architecture allows models to be plugged into these data flows to produce machine learning enriched output. Once the model has been tried and tested, analysts can set up automated data pipelines that process new data. This then becomes a continuous process with minimal intervention from the data scientist and maximal results. On top of it all, each step in the process is logged and monitored for security and governance purposes. All these features come together when integrated with industry-standard cloud services. Being „cloud-native“ is more than just a buzzword—it‘s a paradigm that provides a seamless experience for everyone involved. To be cloud-native, Datameer on Amazon Web Services (AWS) leverages key AWS services. Data platforms that integrate with external data sources, cloud services, and security layers provide an all-in-one solution for today’s analytic needs. Where are the bottlenecks in your agile data organization? Even if you‘re using modern machine learning on the cloud, you‘re missing an opportunity if you‘re still using manual processes to access prepare and explore your data, as well as validate models. With the agility and scalability of a modern data platform, analytics teams can make better decisions and provide faster results. For more information, download this solution brief.